Steyr and Col. Jeff Cooper introduced the first production Scout Rifle to the world at the 1998 SHOT Show, and for more than a decade, Steyr hasn’t introduced a new chambering in the Scout Rifle platform. That is until now. The Steyr Scout is now available in 6.5 Creedmoor. Throughout his decades of development of the scout-rifle concept, including the nearly decade-long collaborative design process to create the Steyr Scout, Cooper was specific in his chambering choices for his ultimate production scout rifle. He wanted the rifle to be able to knock down any North American game, and he wanted the ammunition to be readily available. While the 6.5 Creedmoor wasn’t available in his lifetime, it has become one of the top cartridge choices in the U.S., and it’s become quite plentiful. Steyr and Cooper began collaborating on a production Scout Rifle around 1990, and the Steyr engineers worked within his limitations to produce a rifle that was less than a meter in length, less than about 7 pounds, and it had to be able to take anything in North America from hare to bear. Steyr engineers provided his desired backup “ghost-ring” iron sights that rest snugly within the Steyr Scout’s profile and can be deployed within seconds should the optics fail. They also provided two-stage magazines that could accomplish the same function as the 1903 Springfield’s magazine cutoff but in a much faster manner than the original. Just like the original Steyr Scout, the 6.5 CM version incorporates a spare magazine in the stock with the ability to accept a pair of optional 10-round magazines. The stock also incorporates an integrated bipod, as well as a set of five whale-tail sling-swivel attachments to accommodate a three-point Ching Sling on either side of the stock. “We can never know how the Colonel would have felt about chambering his rifle in the 6.5 Creedmoor, but considering its performance and after extensive testing, we think he’d wholeheartedly approve,” O’Brien said. The Steyr Arms Scout 6.5 Creedmoor has a 19-inch cold hammer forged barrel that is fluted and threaded to accept 1/2-20 RH muzzle devices. 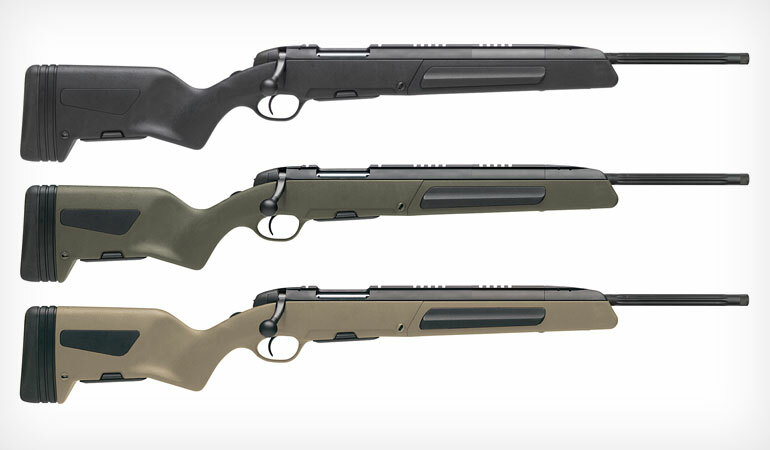 It is now available in Black, MUD and OD Green stocks with an MSRP of $1,735.00.